2-4-6-8........ The Greatest Class. We DOMINATE!! 50 YEARS!...so far! Whooda thunk it? A half century since walking across the stage @ Vet's! Our class of '68 turns 68 years old (most of us this year). It continues to be a daunting task to keep track of us all, but through the efforts of Julie Rowles Lagodney and her team of classmate trackers, we hope to have located most of you (over 725 out of 800+). That is incredible, tracker team!!! This website was created to expedite the processes of both acquiring/sharing your updates since graduation and providing you with the necessary bits of information you require to stay connected via this online website which we will continue to support over the next few years through your generous contributions. You possibly never knew 50% of our classmates existed until you scanned the 800+ names and photos in our senior yearbook. "New friend" potential is likely!! To the far left, you will see a column of important links that will aid you in getting details about our many classmate members. Before you can make any progress viewing SOME of the various links, you will be directed to create a user name/password to sign in, update classmate profiles, and access other private-to-'68ers links, (photos, memorials, still missing...). Directions: Click on the classmates' updates link. You will see a user name/password entry box to the left and a "Not yet a member? Sign up" button to the right. Click on the "sign up" button and then create your user name/password. User name can be anything. Your real name will appear on the approved classmate list. Fill out the contact information questions. Your name, maiden name, and voluntary photos and comments are viewable to all of us. Click submit and your friendly webmaster will then approve you. Enter your username and password each time you sign in to the private classmate links. Once you are an approved member, scan those private-to-68ers links mentioned, upload your photo memories, or add a tribute to a friend no longer with us. Please consider donating to our ongoing website costs. 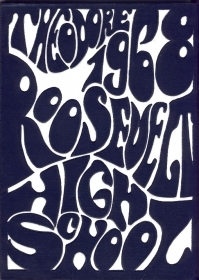 As the Class of '68, we may use excess donations, monetary gifts, and left over coins in the kitty to fund a need or project currently expressed by the Roosevelt High School Foundation. Guests and non-class members may also join us by accessing the public links to leave comments within the "Guests and Guest Book" link. The website will continue to expand and change. Check back often as new STUFF and new LINKS will appear. All data will be viewable via this website to classmate members in the "classmates' updates" section, including photos from this reunion for at least one calendar year. Any questions or issues using the website may be addressed using the "contact us" link.